BEIRUT: A jihadist group dominated by Syria’s former Al-Qaeda affiliate yesterday sealed its grip on northern Idlib, the last major rebel bastion, in a deal ending days of fighting with rival factions. Hayat Tahrir Al-Sham (HTS) signed a ceasefire with what was left of a rival alliance that sees it confirm its supremacy and unites the region under a jihadist-led administration. 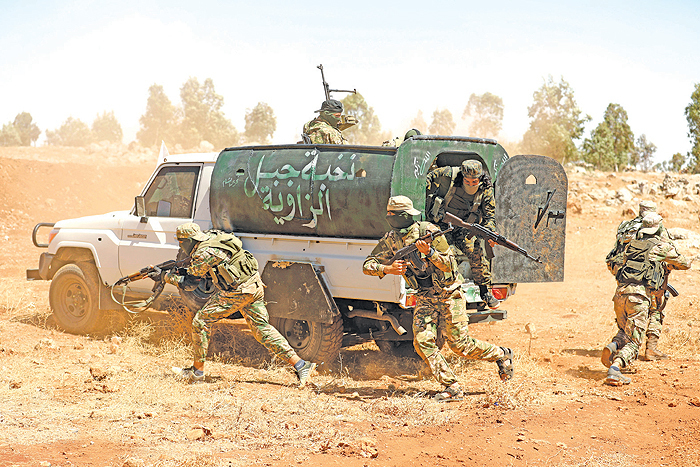 Under an accord reached by rebel backer Turkey and regime ally Russia in September, Ankara was expected to rein in Idlib factions to stave off a threatened government offensive with potentially disastrous humanitarian repercussions. The jihadists’ deal, a copy of which was circulated on local media outlets, brings an immediate end to the fighting between HTS and the rival National Liberation Front, which was directly backed by Turkey. “This morning, HTS and NLF signed an agreement to put an end to ongoing fighting… and establish the control of the salvation government in all areas,” the group’s propaganda channel Ebaa said. The self-proclaimed Salvation Government is an HTS-dominated body which had been administering large parts of the Idlib area, including its eponymous capital. Its reach now extends to most of the Idlib province and parts of the neighboring provinces of Aleppo and Hama. The deal sees Ankara-backed Islamist factions Ahrar al-Sham and Suqur Al-Sham stand down, as areas they once held come under HTS administrative control. These include the two major towns of Ariha and Maarat Al-Noman. Last week, HTS seized dozens of villages from another key NLF component, Noureddine Al-Zinki, in the northeast of the enclave. Other jihadists — such as the Al-Qaeda-linked Hurras Al-Deen group and Turkestan Islamic Party (TIP) — maintain a presence in the Idlib region but are allied with HTS. The clashes between HTS and its NLF rivals in Idlib had killed 137 people on both sides since the start of the year, most of them fighters, according to the Syrian Observatory for Human Rights monitoring group. The deal announced yesterday provides for an immediate cessation of hostilities, an exchange of detainees, the lifting of all checkpoints inside the region, and its unification under the authority of the Salvation Government. Analyst Sam Heller said the latest development put HTS squarely in control of the Idlib region. “Now it can present itself to Turkey and others as an indispensable interlocutor in any non-military solution to Idlib,” said the analyst with the International Crisis Group. It was however unclear if it would make it harder for Turkey to implement the September deal for a buffer zone around Idlib, reached in the Russian resort town of Sochi. “It’s not clear whether the Sochi deal’s success and the continuation of the Idlib de-escalation actually depends on the memorandum’s literal implementation, or more political atmospherics such as the health of the Turkish-Russian bilateral relationship,” he said. Simultaneously, Ankara has been threatening to launch a cross-border offensive against the Kurdish militia controlling large parts of northeastern Syria. The recent announcement by US President Donald Trump that he was ordering a full troop pullout from Syria has left Washington’s Kurdish allies more exposed than ever. They have had to cozy up to Damascus, at the expense of their plans for increased autonomy, to guarantee their survival in the face of Turkish threats. Turkey, which considers the Kurdish YPG militia a terrorist organization, could move into northern Syria to create a buffer along its border. It made its intentions clear yesterday and warned that it would launch an offensive against Syrian Kurdish forces if the United States delays the withdrawal of its troops from the war-torn country.